Read on for what to eat, where to be seen, and where..umm…you might not want to be seen in the land of the Lobos. Onwards!!! Setting: It is 12:45 am on a Sunday. Situation: You are hungry. Very hungry and craving a giant melted butter-covered cinnamon roll. 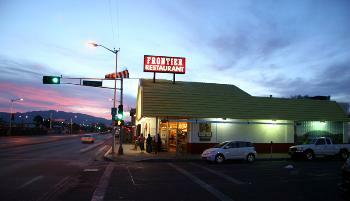 Solution: The Frontier Restaurant located on Central Street right across the street from the UNM campus. They serve freshly squeezed orange juice, roasted green chili, and homemade flour tortillas. All served from 5am until 1am, seven days a week. It earned a prestigious top pick by restaurant blog Roadfood woot woot. And make sure to note all the paintings of Duke Wayne staring down at you while you chow down. Yummy. 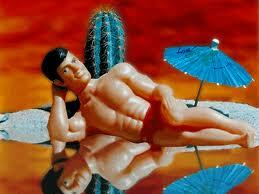 Sit back, relax, grab a magazine and surf the inter webs. 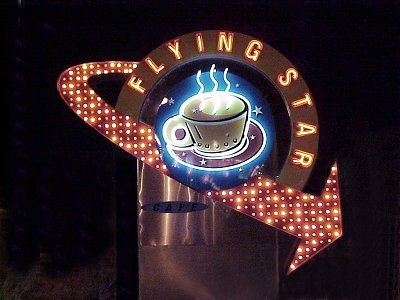 You are at Flying Star cafe. There is an eclectic crowd waiting in line: from yuppies to guppies, from young pediatrics to geriatrics, and from hippies to hipsters all wanting Flying Star’s famous Californian Sandwich or Greek Goddess Salad. Get yourself a Frequent Flier card to get $5 off every $50 you spend at either Satellite Coffee shop or Flying Star Cafe. 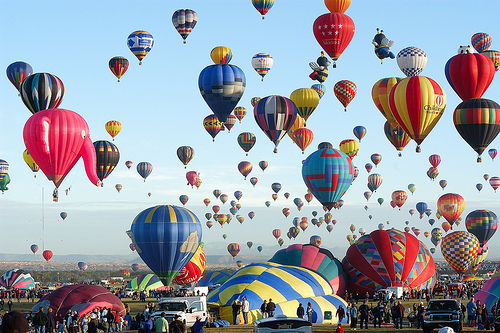 If you plan on visiting Albuquerque in early October, you CANNOT miss the world’s largest hot air balloon festival. 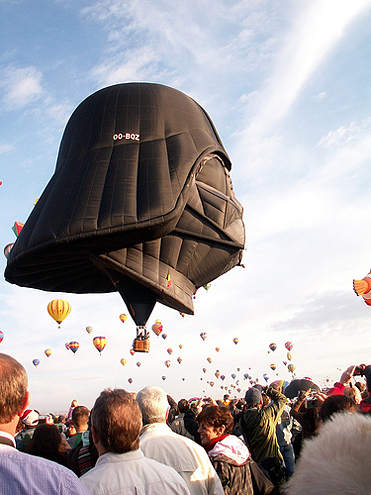 No, literally, you cannot miss it because the balloons are visible from all over the city. Over 750 balloons are showcased including the Wells Fargo Chariot, bumblebees, and, yes, a giant bunny. Albuquerque has all the perks of an urban city and the added bonus of being located in the shadow of 10,000-foot Sandia Peak. Take a hike, grab a horse, and climb a large boulder. Or just sleep in a tent and take photos of yourself for Myspace. 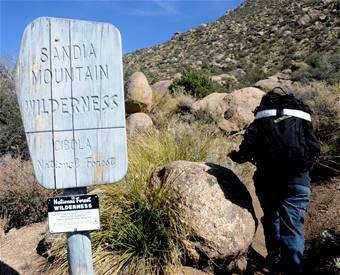 You can do all of those things in Albuquerque’s surrounding camp grounds. And as I take your leave, a gift for our loyal readers……. Incidentally, this post reinforces my desire to get Star Wared up for Trick or Vote.